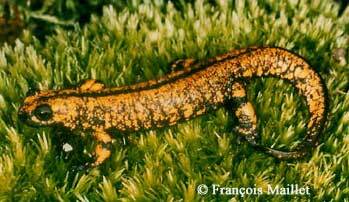 Neurergus strauchii is a relatively large newt, with an adult size of 13-18 cm (5-7 inches). 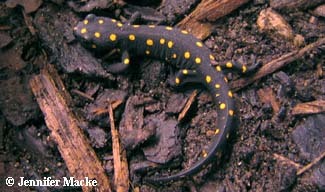 They are easily identified by their bright yellow spots on a black background. The abdomen is black along the sides, with an orange stripe (or broken stripe) down the middle. A "gold dust" color variant of N. s. strauchii has also been described (see photo below). 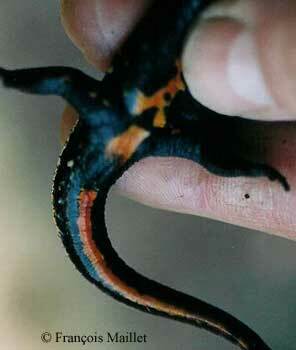 Like most stream-dwelling caudates, these newts are relatively slim overall. Two subspecies have been described. The nominate subspecies, N. s. strauchii, typically has a greater number of yellow spots, and larger spots, than does N. s. barani. While the orange belly pattern of N. s. barani is more often interrupted with black, this characteristic is not a reliable way to distinguish the 2 subspecies. 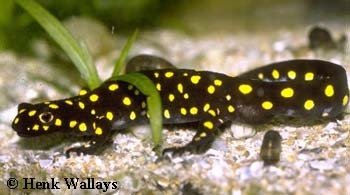 At metamorphosis, the 2 subspecies look similar, but the yellow spots of N. s. strauchii grow both in size and number as they mature, while those of barani do not increase in size or number. Interestingly, the number of spots on adult animals in wild populations follows a west-to-east gradient across their range. N. s. strauchii animals in the western part of their range (closer to the range of barani) have fewer yellow spots than those to the east. The nearest genetic relatives of N. strauchii, besides the other Neurergus species, are Calotriton asper, followed by the Triturus species. N. strauchii shares some morphological similarities with C. asper, and shares many similarities in breeding behavior with Triturus newts. Males and females can be distinguished by the size and shape of the cloaca. Outside of the breeding season, the cloacas of the sexes are not distinctly different. At the approach of breeding season, the male has an enlarged cloaca, and the female has a conical or "volcano shaped" cloaca. Male N. s. strauchii have blue-white highlights on the tail year-round, with these markings becoming more intense and widespread during breeding season. Males of N. s. barani also have white tail highlights that are visible year-round, but they are less prominent than in the nominate subspecies. Gold dust variant of N. s. strauchii. N. strauchii has been found in discontinuous habitats in Turkey (see map below). N. s. barani inhabits the westernmost areas of the range. 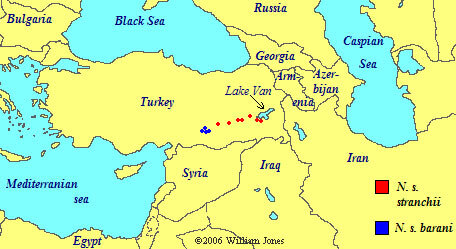 The Euphrates River separates the 2 subspecies. 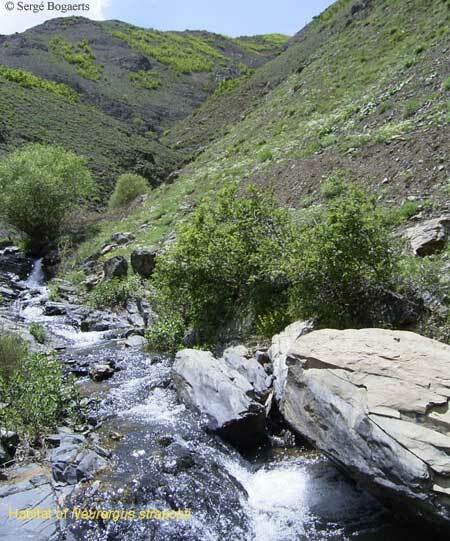 N. strauchii inhabit mountain streams during their breeding season (spring/summer). These streams are fed by snow-melt, and water temperatures as low as 2.5°C (37°F) have been recorded in the wild habitat of N. s. barani. They inhabit nearby terrestrial habitats during other parts of the year. Thus, these newts require relatively complex native habitats that include an aquatic stream area, a suitable terrestrial area, and unimpeded access between the 2 zones. The streams utilized by N. strauchii are small, typically 0.5 - 2 meters (1.5 - 6 feet) wide. The stream bottom where they have been observed always consists of rocks, stone chips, and gritty or fine sand. Aquatic vegetation is usually absent. The nearby terrestrial habitat is usually sparsely covered with small vegetation. Shrubs and trees are rare. When found on land, the animals are found in rocky crevices, not under vegetative cover. During the course of geological changes, the range of this species has probably become more restricted over time. The adaptation of Neurergus to high mountain brooks may have trapped them within increasingly restricted areas. The species is currently found only in isolated locales. Intervening uninhabitable areas almost certainly prevent the mixing of animals between locales. All Neurergus species are listed by the IUCN as "vulnerable" and all are protected by the Bern Convention, which was ratified by Turkey in 1984. In Europe they are also protected by the Habitats Directive, which protects all species in their native habitats and also prohibits the removal of specimens from these habitats. 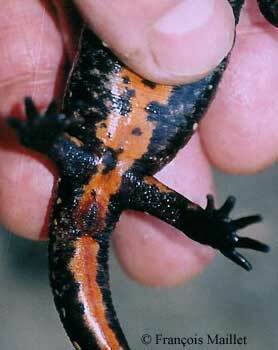 Because they live in marginal conditions, Neurergus newts are very sensitive to environmental changes. Due to the discontinuous nature of their range, a population has no chance of natural repopulation following any localized extirpation. It is believed that pressures from humans on the habitats and waterways of these newts have had a significant impact in recent years. Waste disposal, use of agricultural chemicals, and road building have had negative impacts. All 4 species of Neurergus are believed to be at risk of serious population decline. N. strauchii already appears to be absent from some of its former localities. N. s. barani is at particular risk due to its limited range, its small number of localities, and plans for land development of the area. Most currently-known captive specimens of N. strauchii in Europe and the U.S. are descended from specimens collected by European scientists who identified the species and brought a few back to Europe. Because they are not difficult to propagate, captive breeding should be sufficient to perpetuate this species in captivity. Captive-bred animals are becoming increasingly available, both in Europe and the U.S.
At the time of this writing, the best approach to housing N. strauchii is not universally agreed-upon. There are basically 2 schools of thought. The first school of thought is that it is best to replicate the natural yearly life cycle of the animals in the wild. Thus, the adults are kept in a terrestrial setting during the summer, fall, and winter, then transferred to water in the spring for breeding. Following breeding, the animals are moved back to a terrestrial setup. The second school of thought is that these animals appear to be quite healthy being maintained totally aquatic all year round, provided that their temperature is kept cool. One principal that is true, regardless of the choice of terrestrial or aquatic habitat, is that acidic substrates and water should be avoided. The natural waters inhabited by these animals have been measured at a pH from 7.0 to 9.0 and a general hardness of 1-11 dGH (very soft to very hard). Their native habitats are rich in limestone. As a result, the water tends to be hard, except during periods of heavy rainfall. Limestone rocks are highly recommended for use in captive enclosures. If the aquarium water is soft, or below pH 7.0, add some form of calcium carbonate to the tank or filter. If limestone is not available, Calci-sand, crushed shells, and bird grit are all forms of calcium carbonate readily available in pet stores. Acidic materials, such as moss or peat, should be completely avoided. Plants are usually absent in their native habitat, and appear to have little effect on the animals' behavior in captivity. A habitat that includes many rocks and crevices most closely mimics their natural surroundings and is strongly recommended. 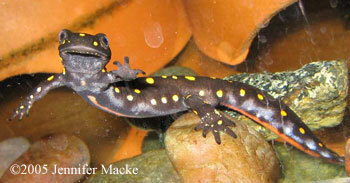 Unlike most newts, these animals appear to prefer spending their time among rocks, not plants. Outside of the breeding season, wild N. strauchii are found under rocks. Appropriate terrestrial housing for N. strauchii consists of a slightly damp substrate composed of soil or a mixture of soil with bark or coconut fiber. Plenty of hiding places should be provided. These shelters can be cork bark, stacked rocks, or bricks. Branches and leafy vegetation may be included, but should not be the sole form of shelter. A water bowl should be provided, and most individuals, even juveniles, will enter the water occasionally, especially if food is offered there. Care should be taken to provide good ventilation. While they do not need high air humidity nor spraying of water in the tank, be sure that the substrate does not become dry; like all newts, they will die if their substrate dries out. 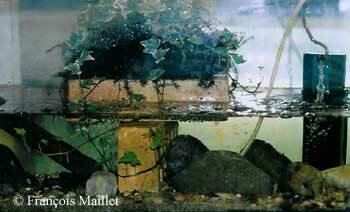 Appropriate aquatic housing for N. strauchii consists of an adequately-sized aquarium furnished with stacked rocks. 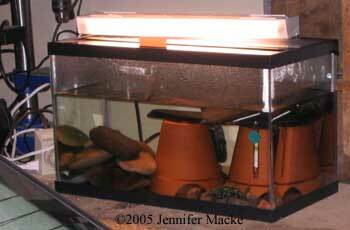 For example, 4 adults would need a tank of minumum size 60 x 30 cm (24 x 12 inches), preferably larger. While the animals are not shy, they do appreciate having rocky crevices in which to hide. The filter used should provide a current in part of the tank. These animals are totally fearless in the face of water currents, and they will not be stressed by it. Water level can be fairly deep, 15-30 cm (6-12 inches). Ideally, the animals should be provided with a light cycle that mimics nature, with longer day length in summer, and shorter in winter; however, it is not known whether this has any importance in breeding success. In their native habitat, N. strauchii must be able to tolerate high temperatures. However, it appears that they are more temperature-tolerant when kept terrestrially. Water temperatures where these animals have been found in the wild have ranged from 10.9 - 17.2°C (52-63°F). If kept aquatic in summer, temperatures over approximately 25°C (77°F) have been known to result in death. Being kept aquatic in summer may also be associated with weight loss, as newts have a higher metabolic rate when living in water. Thus, if no basement or fully-reliable cooling system is available, the animals should be moved to a terrestrial habitat at the onset of hot weather. Bear in mind that every air conditioning system has the possibility of break-down, and this invariably happens in the hottest possible weather. Male N. s. barani (outside of breeding season). Female N. s. barani, showing "volcano-shaped" cloaca. In the wild, N. strauchii require an environment rich in invertebrates. In captivity, N. strauchii will eat many foods that are typical for captive caudates. They do well on a staple diet of earthworms. They seem to be particularly fond of crickets. Even aquatic strauchii will enthusiastically take a cricket that is held underwater for them. Larval and juvenile animals do well with appropriately-sized grubs, Daphnia, earthworms, blackworms, whiteworms, and crickets. When kept terrestrially, N. strauchii are somewhat shy, but can be conditioned to hand-feed. Nearly all strauchii, even juveniles, are willing to enter a shallow feeding dish to eat, so it is possible to feed the terrestrial animals typical "aquatic" foods, such as live blackworms and chopped earthworms. Crickets (supplemented with an appropriate vitamin/mineral powder), fly larvae, and small waxworms are also accepted. When kept aquatically, N. strauchii become very bold; it is easy to train them to hand-feed, and thus easily monitor the amounts they are eating. N. strauchii have a very definite limit to the amount of food that they are willing to accept at a single feeding, perhaps due to their slim build. The keeper soon learns almost exactly how much food the animals will take at each feeding. 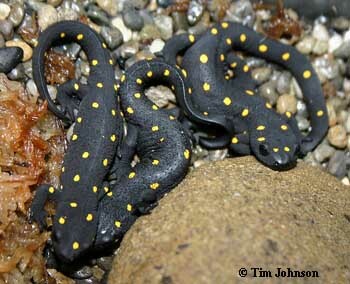 During warm weather, these newts do not significantly increase the amount of food taken per feeding, and thus it may be necessary to vary the frequency of feeding, rather than the amount. Furthermore, the animals need to eat much more often when kept aquatically than when kept terrestrially. Frequency of feeding may need to be varied from daily to every 6 days, depending on the animals' age, form of housing, and temperature. Male N. s. strauchii showing white highlights on the tail and flanks during breeding season. Female N. s. barani laying eggs on the underside of a rock. There are 2 approaches that have been successful in breeding this species. Method 1: the adults are maintained aquatically all year at moderate temperature (16-20°C; 60-68°F), with the tank being moved in winter to a cold location (4-12°C; 39-53°F) to stimulate breeding. Method 2: the adults are kept terrestrially during the summer, fall and winter, with temperature during the winter period kept similarly cold. Then the animals are moved abruptly to an aquatic setup in early spring. Using either method, the critical factors in breeding appear to be a "chilling" period of several weeks or months, followed by an "egg laying" period consisting of gradually increasing temperatures with the onset of spring. Egg laying consistently occurs at 12-16°C (53-61°F). Providing an extended period of time in this range of temperatures may encourage a prolonged egg-laying period. Note that the chilling period is not a hibernation. During this time, the animals will remain fully active. Although they eat less, they continue to have an appetite and should be fed in order to provide the energy reserves needed for egg production. If they refuse food at some feedings during this period, feed less often. In the wild, breeding activity has been observed in April and May. Depending on the temperature and habitat provided, egg laying in captivity may begin as early as February. The basic courtship behavior of N. strauchii is nearly identical to that of Triturus newts. This is considered an oddity, because this form of courtship is typical for pond-type newts, but atypical for stream dwellers. The male waves his tail in an undulating manner toward the female. He deposits a spermatophore, which the female picks up with her cloaca. Fertilization is internal. Although the animals are somewhat secretive, with their courtship taking place in their rock hideouts, the ritual can be observed during both the "chilling" period (if aquatic) and the "egg laying" period. In the wild, eggs are found on the underside of rocks, and also occasionally on tree branches where they are exposed to sunlight. In captivity, most eggs are laid on the underside of rocks, but some are deposited in other diverse locations, including the sides of the tank and even the floor of the tank and the inside of pots. Eggs are laid singly, or in small groups. 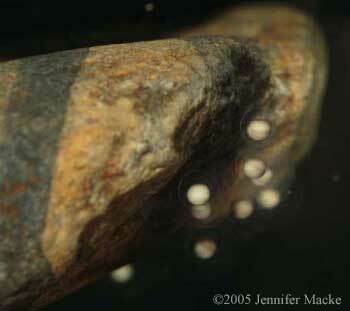 To affix the eggs to the underside of rocks, the female lies on her back, often sandwiched between rocks. Females will continue to lay eggs for 2 months or more if kept at the appropriate egg-laying temperature range. Despite their slim build, a full-grown female has been known to produce over 200 eggs in a single season. It is currently unknown whether the ratio of males:females has an effect on the success of breeding. However, several breeders have reported best success with ratios of 1:1 or 1:2. Some adults have been reported to eat their own eggs. N. s. strauchii eggs just after being laid. N. s. strauchii eggs near hatching. The eggs of N. strauchii are quite hardy. 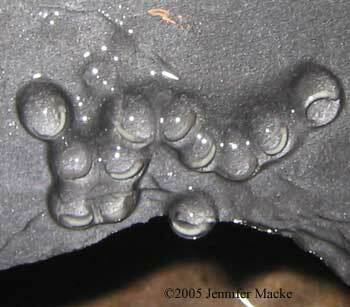 The eggs are attached to rocks and other hard surfaces by a thick jelly. It is very easy to scrape off the eggs using a straight-edge razor; the jelly protects the eggs from damage. Until they hatch, the eggs can be either (1) left attached to the rocks where they were laid and kept in a deep tank or tub with aeration or (2) they can be removed and kept in a shallow tub without aeration. If removed, it may be wise to transfer the eggs to a clean container of water every 2-3 days to prevent the growth of bacteria or mold on the inside surface of the container. If the eggs stick to the inside of the container, they may be gently scraped off. Temperatures of 15-21°C (60-70°F) work well for keeping the eggs and larvae. Eggs take approximately 3-4 weeks to hatch. N. strauchii larva (1 month post-hatching). N. strauchii larva (2 months post-hatching). N. strauchii larva approaching metamorphosis (3 months post-hatching). N. strauchii post-metamorphosis (but retaining gills). Raising N. strauchii larvae is very much the same as raising other species of newt or salamander (for general information, see Raising Newts from Eggs). They accept the same types of micro-foods as other larvae. At hatching, they are relatively large (much larger than Triturus hatchlings), and easily able to eat Daphnia pulex, whiteworms, or chopped blackworms. They are not stressed by frequent water changes. Care should be taken to ensure that the water is pH 6.8 or higher. Like other stream-dwelling species, Neurergus larvae have relatively low tails, low dorsal fins, and small gills. Although they are not intimidated by a current in their tank, a filter is not strictly necessary. They do well in captivity with just a strong airstone to provide oxygenation and agitation of the water. As shelter, pebbles and rocks are the most natural choices, but plants such as Java moss can also be used. N. strauchii reach metamorphosis at approximately 3-5 months after hatching. 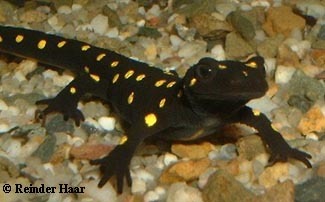 At metamorphosis, the juveniles develop the distinctive yellow-on-black coloration. They are also likely to lose their gills and emerge from the water onto land. Plenty of easy access to rocks above water must be provided. If the keeper is able to provide year-round cool temperature, the juveniles can be kept aquatically in an aquarium with plenty of stacked rocks. In some cases, if larvae are kept cool, they may retain gills for some time after undergoing the color change that signals metamorphosis. In the wild, a similar phenomenon has been observed – some juveniles overwinter and are found still in the water (with gills) in their second year. If summer will be hot (over 23°C/74°F), it is best to move fully metamorphosed juveniles to a terrarium, set up as described above for the adults. The juveniles, like the adults, are more likely to need to stay terrestrial at high temperatures. Juveniles reach sexual maturity at 2 to 4 years of age. Bogaerts, S, Pasmans, F, and Woeltjes, T (2006) Ecology and Conservation aspects of Neurergus strauchii. Vences, M, Kohleer, J, Ziegler, T, and Bohme, W, eds. Herpetolgia Bonnensis II. Proceedings of the 13th Congress of the Societas Europaea Herpetologica, pp. 15-18. Bogaerts, S, Pasmans, F, Sparreboom, M, and Biricik, M. (2010) Observations on a breeding population of Neurergus strauchii barani Oz, 1994 (Caudata: Salamandridae) on Kubbe Mountain, Turkey. 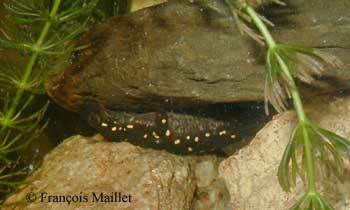 Salamandra 46(1): 55-58. French Urodela Group, particularly François Maillet. Personal communication. Neurergus Working Group: Christoph Bork, Tina Ernst, François Maillet, Günter Shultschik, Henk Wallays, and particularly Sergé Bogaerts. Personal communication. Pasmans, F, Bogaerts, S, Woeltjes, T, and Carranza, S. (2006) Biogeography of Neurergus strauchii barani and N. s. strauchii assessed by morphological and molecular data. Amphibia-Reptilia, 27: 281-288. Schultschick, G. Neurergus crocatus species information and registry. Sparreboom, M, Steinfartz, S, and Schulschik, G. (2000) Courtship behavior of Neurergus. Amphibia-Reptilia 21: 1-11. Steinfartz, S, Hwang, UW, Tautz, D, Oz, M, and Veith, M. (2002) Molecular phylogeny of the salamandrid genus Neurergus: evidence for an intrageneric switch of reproductive biology. Amphibia-Reptilia 23: 419-431. Schultschick, G. (2010). Neurergus strauchii strauchii (STEINDACHNER, 1887) - Strauchs-Bachsalamander - Strauch's Brook Salamander (caresheet in German). Macke, J. (2004). Neurergus experiment: aquatic vs. terrestrial. Forum thread. ©2006 Jennifer Macke. Posted May 2006. Revised December 2006. Revised March 2011.